Signs come in a variety of shapes and sizes. Which is the right solution for you? Take a stroll through any new retail development, and you’ll quickly notice just how many sign options are available. Today's signage options are diverse and numerous - ranging from electronic LED signs that shine through the darkness to signs designed to move in the wind. Even your vehicle can be a "sign" for your business. The options available are staggering and more creative than ever. 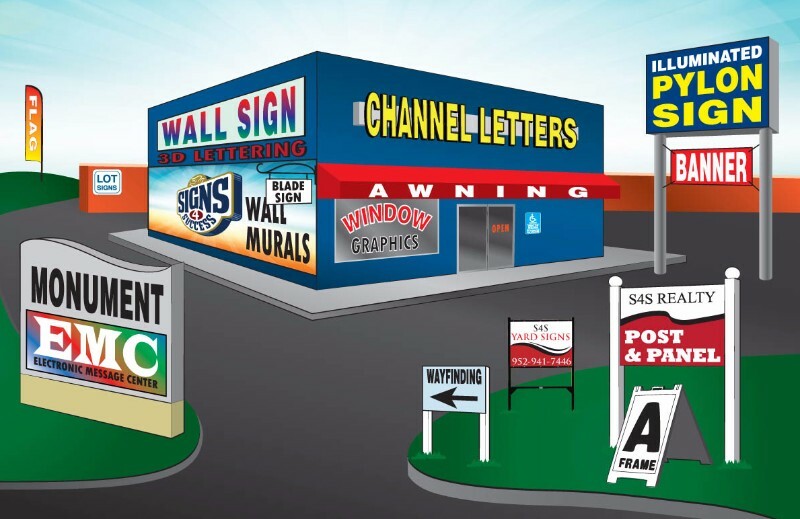 The illustration, below, shows examples of some of the major outdoor sign types. Signs4Success provides expert consultations to help customers navigate signage options and choose solutions that best serve your business. We take the time to get to know our clients, so we can recommend the best solutions for their business needs and budget. Feel free to explore the information we've provided on various sign types, and then give us a call or drop us an e-mail for more information - we're always happy to help! Parking signs, towing signs, regulated signs and more!